During the US Open, Serena Williams coach was caught making hand signals. Serena Williams was accused of cheating, and the clip of her addressing the umpire went viral.The 23-time Grand Slam winner went on to lose the match 6-2, 6-4 to Japan’s Naomi Osaka. Serena during the confrontation called umpire Ramos a “liar” and she also called him a “thief” and was penalized a game because it was her third violation during the match. 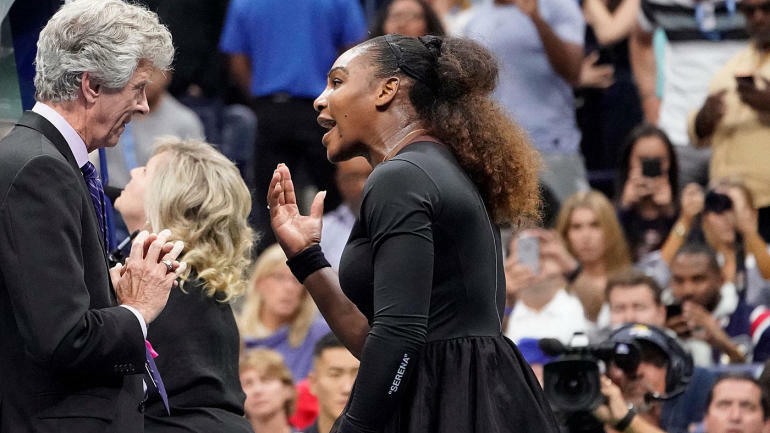 Williams called chair umpire Ramos a ‘liar’ and a ‘thief’ during the straight sets defeat to Naomi Osaka and was penalized a game as a result of being handed a third violation. The first two violations being the hand signals from the coach and for smashing her racket. “Because I’m a woman you are going to take this away from me?? That’s not right. This is where we have to stop Serena. Look, in today’s day in age every time something doesn’t go a certain way someone wants to find a way to make themselves the victim. I do not understand where this notion came from. We are going to get to the data here in a moment on why Serena calling the referee and umpire “sexist” is 100% wrong, and that if you are a man you get away with more is wrong in a moment. But, I want to point out the simple fact that you were playing against a WOMEN Serena! A women who is also a minority! So what in the world are you talking about? Why must you try to portray your self as a victim? The reason Serena was penalized was not because she was a women, but because she was acting out of line. Actually, men get penalized nearly three times more as women. And if we want to factor in that men usually play 5 sets to women’s 3 sets men would still be penalized nearly twice as much as women. So to claim that there is different treatment in the way you are penalized is an absolutely absurd argument by Serena. Serena Williams major issue is she is part of the problem with the Social Media world. When someone like Serena can only get praised by the media, only praised by the world of twitter and if you speak otherwise you are labeled either a sexist or a racist.. that’s an issue. Go give it a try, criticize Serena Williams on Twitter or Facebook or Instagram or anywhere on Social Media and check out the reactions. People will flock to you, call you racist and label you as a sexist. When in reality, you are only speaking facts. Serena Williams is arguably not only the greatest women tennis player in history, but the greatest female athlete in the history of this country. She’s absolutely amazing at what she does. However, for her to berate an umpire, call him a “thief” and a “liar”… and expect praise? That’s absurd. Lastly, I believe Serena berating the umpire, calling out sexism and racism is a huge problem for tennis. Why? Because, in this modern day Social Media world we live in, any future umpire who would dare to penalize Serena Williams will likely receive backlash or worse yet lose their job. Serena Williams actions have enabled the victim culture to come out. Why have we made it cool to be a victim in this modern Social Media world? What will it take to stop this false spread of information of calling everything “sexist” or “racist”? Maybe just a quick look at the facts and a deep breath from now on can put an end to being quick to claim being the victim. Note to the writer. Women is plural and woman is singular. Once is a mistake, doing it the whole way through the article is ignorance. See the examples: Serena is a WOMAN. Women had less penalties than the men did in Grand Slam tournaments from 1998-2018. In fact, I see other headlines with the same mistake. So, if you want to be taken seriously as a writer, try to minimize these mistakes. This is just a big pet peeve of mine. Just like lose-loose.